I finally updated my sidebar with a list of friends, colleagues, et al (see "con-conspirators" below-right). If you're listed please check to make sure I linked to the site you'd prefer to be your public face. If you're not listed, either I couldn't find your link in my bookmarks, or you just haven't greased my palm lately. So pony up and maybe I'll show some love. I hadn't heard about this documentary, and now I'm looking forward to it. Unfortunately, there's no trailer on the site yet (boo! ), even though the film's been screening around the country for months. Meantime, I quenched my thirst by reading this column from a couple years ago, about Pixar's 10th birthday. Moby has released a bunch of instrumental scores for free non-commercial use by people making independent films. Snippets of the distressing things fundamentalists say on discussion boards. You may envy me that I don't have a job these days, but I'm certainly occupying my days (and nights) with plenty of stuff, and not all of it is necessarily fun stuff. Here's what I've been up to (in no particular order) since my last list on February 13. Finally filed for unemployment, at Anne's insistance. Updated my résumé for the first time in several years. Compiled receipts, 1040s, etc. for our 2007 taxes. Washed the cat, with Velma's help. Went to numerous Kaiser appointments with physician's assistants, physical therapists, and doctors. Helped Velma in the garden, cleaning up after her planting frenzy, cutting some ivy and weeds, planting some wildflower seeds. Swept the driveway and pulled some weeds in front of the flat. Organized one of the shelf racks in the garage. Called the IRS. Fun ensued. Stayed up really late, got up really late. Did a lot of miniscule but time-consuming paperwork. Swept the kitchen a bunch. Went to our storage facility, broke off the lock we lost the key to, went and bought a new lock, gathered a box of stuff I wanted and a toboggan Velma wanted. Went to Wondercon, with a broken shoulder, without Yennej. Dropped in on the Peninsula Conservation Center to visit with some of the people I used to work with. Read a lot of stuff on Wikipedia, including the entries on Nikola Tesla, Ruđer Bošković, the 2004 Beslan massacre, Living Loud, Bob Daisley, Ozzy Osbourne, and Randy Rhoads. Updated Wikipedia's pages on Adam Werbach and Bob Daisley. Met with Phu and her mentee to tell her about the business of being a graphic designer. Resized an ad for the Jefferson City Irregulars. Wrote reviews of several DVDs (to be posted later). Made a list of all the books that have been published about Ozzy Osbourne, with notes on the ones I own (to be posted later). Bought a few valuable bootlegs. Bought some very old and hard-to-find tour programs. Tried to find pictures of keyboardist Lindsay Bridgewater (to no avail). Organized our stamps (I know that sounds lame, but we have a lot of random 3¢, 10¢, 50¢, and 78¢ stamps, so it took 30 minutes!). Read a lot of newspaper reports and blog commentary about the Pacific Lumber Company bankruptcy case. Bought some boxes to organize one of my CD collections. Started organizing my Ozzy collection (books, records, CDs, DVDs, article clippings, etc.). Further organized and annotated my Heinlein collection. Started re-reading The Moon is a Harsh Mistress which I haven't read since I was about 18. Opened an Amazon Seller account and listed some books, magazines, and DVDs I don't want anymore. Listed most of my design library on Shelfari and invited some friends to try out the site. Backed up Velma's computer and upgraded the OS to Leopard. Ripped a few CDs to our iTunes master library. Attended Adam Werbach's speech at the Commonwealth Club. Attended Save the Redwood League's 90th birthday event at the San Francisco Botanical Garden. Surprised Velma and my mom by taking them to Cirque du Soleil. Got fairly feathered at the SF Pillow Fight Club on V-Day. Went to a party with old middle school chums. Further updated my master password list of all my online accounts. Went shopping for flea remedies (see "Washed the cat," above). Listened to KQED a lot, but not enough. Performed proscribed physical therapy shoulder exercises once or twice a day. Watched a lot of Ozzy and Randy Rhoads videos on YouTube. Discovered and downloaded a bunch of Ozzy and Randy Rhoads bootlegs. Designed several iterations of a Product Detail Page for the secret project. Performed competitive analysis for the secret project. Continued to consolidate data from three computers on one. Installed another HD in my computer that I'd had lying around for two months (had to wait until I needed to restart). Tried out Firefox 3 Beta. Met with some former colleagues at CNET Networks. Tried to figure out why one of my two Dell monitors died suddenly. Continued research on a very long article I've been writing for over five years. Made some design tweaks to a booklet I made last year for the Save the Redwoods League titled "The Redwood Highway: Sights & Experiences Between Southern Humboldt & Crescent City." Took photos on several Photo Days around various parts of the City. Organized some of my digital assets. Downloaded some software to try. Continued to lose the war on fight spam. Ate a lot of cookies. Organized and consolidated all my computer/electronics hardware (misc. parts, cables, cards, HDs, etc.) and got rid of a bunch (donating them to Goodwill or recycling them via Green Citizen). Finally figured out a way to run multiple copies of the same version of Firefox. Wrote a a how-to article about the above Firefox problem/solution. 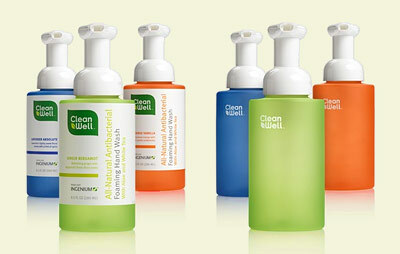 Went to three different stores trying to buy CleanWell natural antibacterial hand soap. Did some digital imaging pre-visualizations for an animation sequence for my friend Holly's latest documentary, about the use Agent Orange in Vietnam. Read more of the magazines that have been piling up for 9 months. Read a lot of design blogs. From aerospace to food services, robotics to watermills. Now that's a global corporation. Ten points if you can figure out why this site is humorous. I guess I was lucky. I got to do all of these things as a kid. Although it wasn't spears, it was Jarts (later banned), and the I didn't do the driving bit until maybe 13 or 14. In an interview with an Irish TV correspondent, Not-My-President Bush shows just how much of an idiot he is. "History will judge what I'm about." A blog of Russian interestingness. Apparently written by actual Russians, since the English is a little broken here and there. For the longest time, while using Firefox 1.x I was able to run two or more copies of the application at the same time. This was useful for partitioning my work and protecting it from being lost if there was a FF crash (which there were a lot of in the later Firefox 1.x days). If one instance crashed, the other would still keep chugging along. This was especially necessary because we didn't have Session Restore in back then. When Firefox 2 came out, this capability was lost. I tried to figure out how to do it again by following several methods I saw mentioned on the the web, but none of them worked, and alas, I'm not nerdy enough to figure out why not. I'd always get a damn error message complaining that I'm not allowed to run multiple instances of the same app. It didn't work even if you copied the app to a different folder and launched the copy. It didn't even matter if one was Firefox 2.1 and the other was Firefox 2.3.4. No work. While you can run an old copy of Firefox 1.x at the same time as Firefox 2.x or even a beta copy of 3.x, you can't run two copies of Firefox 2.x on the same machine at the same time, not even if one is version 2.0 and the other is version 2.5. But, lo! I finally found a method that works. 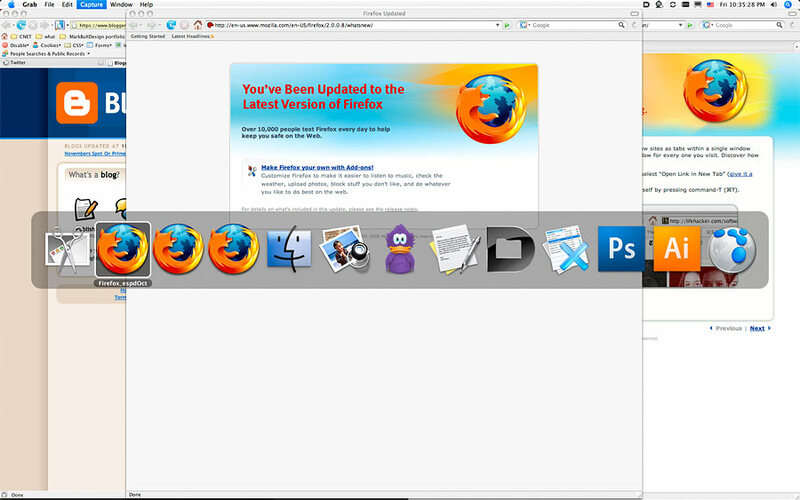 As you can see from the screenshot, I'm presently running three instances of the same version of Firefox on Mac OS X. First, Quit Firefox if it's running already. 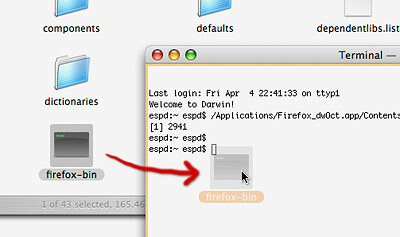 Start Terminal and type in the directory path to your Firefox application. It'll probably be similar to mine below. Note that "espd" is my username, so yours will be different. "Firefox_dwOct.app" is what I've named my app, but yours will probably just be "Firefox". It must be followed by the rest: "/Contents/MacOS/firefox-bin" is standard for a normal Mac OS X install but it could be possibly be different for you (probably not, though). 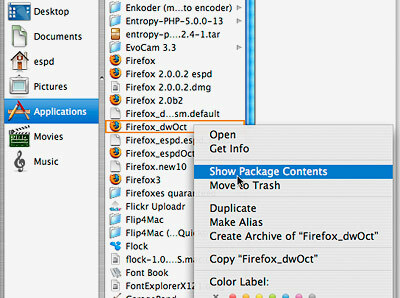 If you can't figure out the right path to the app's binary file (the "firefox-bin" part), then here's how to find it: In the Finder, open your Applications folder, find the Firefox icon, and right-click (or Control-click) to get the Contextual menu (pictured below), and select "Show Package Contents." That's how you see the files inside an application bundle. Now, inside the Finder window that will open, you'll see a folder named "Contents." Double click it, and you'll see a few more icons, including a folder titled "MacOS." 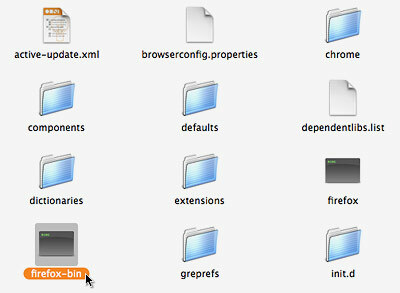 Open that one and look for the file called "firefox-bin", with an icon like a Terminal session (pictured below). Now arrange your Terminal window and the Finder window so you can see them both, and simply drag the "firefox-bin" icon directly into the Terminal session after your username-prompt (pictured below), and it'll instantly fill in the correct path. OS X is pretty neat that way. So once you've got the path to your Firefox app in Terminal, you'll need to change the example text "YourProfileName" to your actual profile name. 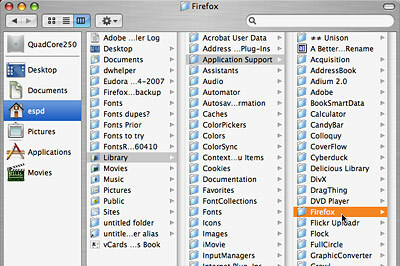 If you don't know your profile name, here's how you find it: In the Finder, navigate from your Home folder (usually your username, like mine in the screenshot below) to the folders "Library > Application Support > Firefox". Inside the Firefox folder is your "Profiles" folder. You probably only have one profile inside, and it probably has a weird name like "65d7ghtn.default", although it might instead be called something like "qtgfxqc3.YourName". That "YourName" part will actually be a profile name, not "YourName". You chose a name when you first installed Firefox way back in the Dark Ages, and you've probably never seen it since. Whether it's "YourName" or "Fred" or just "default", you can put that in where I've got "YourProfileName" in the example below. Now just type the "-no-remote &" part, then hit your Return key and Firefox will launch the Profile Manager (pictured below). This is a part of Firefox most people never see, but it's handy. It's off by default, but the Terminal command "-P" turns it on. Now you want to un-check the "Don't ask at startup" checkbox, because if you're going to use multiple profiles you want Firefox to launch the Profile Manager each time you start Firefox, so you can choose which profile to use. If you only have one profile listed, at this point create a new one. Follow the dialog boxes and it'll step you through the process, then it'll launch the browser as normal. Now go back to Terminal and copy and past the command again, this time using the other profile name you haven't initiated yet. 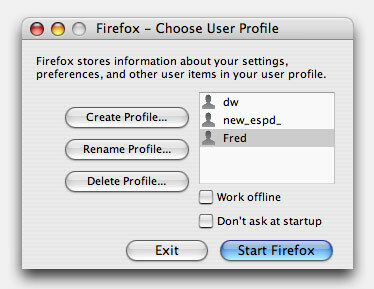 A new Profile manager will launch, you can select the profile you haven't launched a browser for yet, and click the "Start Firefox" button. Voila! Two instances of Firefox running, using two different profiles. PS> I should note that it's the magic "-no-remote" Terminal command that allows you run two or more instances of an app. You can do it with many other apps too, if you like (not all will work, your results may vary). Al Gore has launched a $300 million climate change initiative, one of the most ambitious and costly public advocacy campaigns in U.S. history, according to the Washington Post. When you play this video, notice the W in "we." How much do you want to bet it's going to flip over and become "me" if you go to the site and join in? I'm pretty sure I posted this a couple years ago, but it's such a classic I had to repost it. When Jason sent me this description, at first he was playing an April Fool's joke on me. But the Humboldt squid is real. "A mysterious sea creature up to 7 feet long, with 10 arms, a sharp beak and a ravenous appetite, has invaded ocean waters off Northern California. Packs of fierce Humboldt Squid attack nearly everything they see, from fish to scuba divers." This is a really innovative branded game built with Flash. It's sort of a noir detective story; you have to collect clues and items and the story unfolds. You'll need a lot of time to play it, but it's really engrossing...or would that be engrolsching? My friends over at ZDNet have launched their redesigned website and it's looking great. I never used ZDNet that much before, but the new changes to the site make finding content and just browsing around a lot more pleasurable. 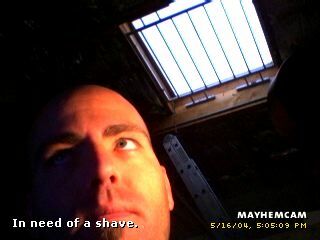 I spent some time the other day watching some of the interesting videos in the "Green Enterprise" section. 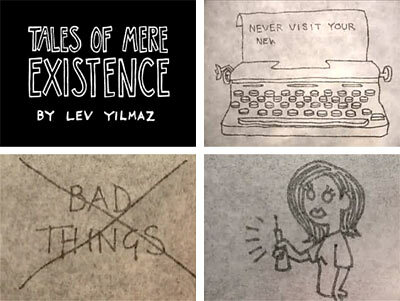 Lev Yilmaz uses a great low-budget animation technique: He films himself drawing his cartoons in realtime, but from underneath, through a glass pane. So he has to write all the dialog in backward letters. It's an effective technique, and it must speed up the animation process tenfold or more (no stop-frame necessary). But it wouldn't be worth a lick if the narratives themselves weren't downright funny, and Lev's certainly are. You can see more of his work at Ingredient X, or all his videos on his YouTube page.